In March 2012, Titus and Amaro almost got put out to pasture. Not that they would have minded some downtime chowing on prairie spring grass. But the folks in Winnipeg howled in dismay. No way should these two beloved black Percheron/Thoroughbred crosses leave the city streets. You see, Titus and Amaro are the faces of the Winnipeg Police Service’s Mounted Patrol Unit. Earlier this year, the unit was slated to be disbanded along with fall recruitment and the purchase of some motorcycles as part of a cost cutting measure to shave one million dollars off the budget. Not so fast, responded Winnipeg residents and business owners alike, who saw in the horses the most popular community relations image of their police service. As a result of this swift push-back, the Winnipeg Police Service reconsidered its plans and decided that their mounted unit would ride the streets for at least another year. Photo (left) courtesy of Sergeant Julie Cecchetto, Halifax Regional Police, Mounted UnitPolice horses such as Cruise, ridden by Diane Woodward of the Halifax Regional Police Mounted Unit, act as ambassadors for the police by improving relations with the community. What is it about police horses that continues to draw people to stroke noses and ask questions? 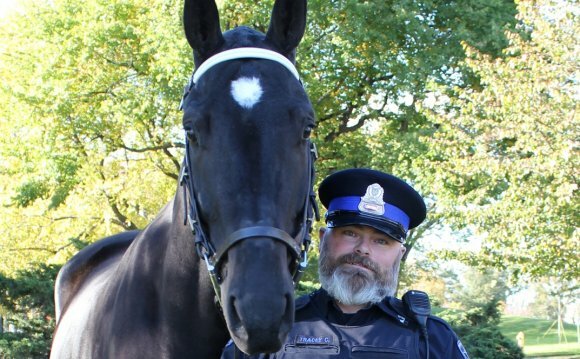 From Vancouver to Halifax, police horses draw the public like a magnet. Their high profile presence never fails to draw admiration, whether at festivals and special occasions, in parades, or when accompanying visiting dignitaries and doing crowd control. But preparing a suitable horse for work on the streets takes time and specialized training. Once a horse has been purchased, training starts with basic flat work and conditioning. Depending on time, budget, and resources, training can be anywhere from, literally, on the job training (as with the Halifax mounted unit) to a period of 12 to 18 months’ duration (as with the Toronto and Calgary mounted units). As the horse progresses, specialty training is introduced to teach the horse how to cope with stressful situations such as smoke, loud noises, gunfire, and hostile crowds. Police horses need to be able to respond directly to the rider, cope with sudden unexpected situations, and behave in a reliable way for the safety of the rider and the public alike. The qualities of an ideal police horse are very similar coast to coast. They are mostly draft crosses on the tall side at 16 to 17 hands, and all have steady temperaments with a willingness to work and to please. Versão Acústica is the first album by Brazilian Acoustic rock musician Emmerson Nogueira. It features covers of hits from many famous bands and musicians, like Pink Floyd, Eric Clapton, Deep Purple and Simon & Garfunkel.